A ready to cook meal box is a simple answer to all these. These boxes have all the ingredients required to cook a gourmet meal, in just the right quantity. A step by step direction is provided for you to finish your cooking under thirty minutes. 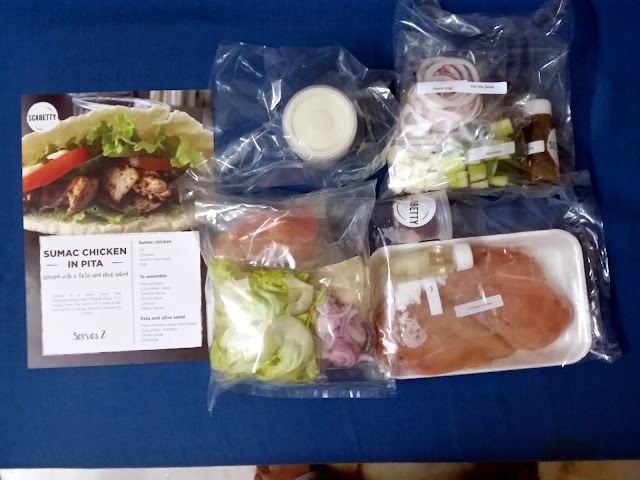 The recipes are tried and tested and the quantities are measured, so there is no need for the chef to taste the meal to decide on the quantities. Scabetty is a new entrant in this field, currently focusing on Lebanese, Mexican, South East Asian and European cuisine. The menu that they offer is carefully designed so that preparing no item takes more than half an hour. Diligently sourced ingredients including meat, vegetables, spices and oil are neatly packed in the right quantity in a large cardboard box along with a leaflet which explains the step by step preparation method with photographs of every step. I was approached by Scabetty to try out two items of my choice from their menu and provide feedback on my experience. I chose a Lebanese delicacy Sumac Chicken in Pita (served with feta cheese and olive salad) and the very common Thai Green Chicken Curry (served with Som Tam salad and sticky rice). I ordered through their portal through a simple process and bingo the packages arrived at my home. As I opened the boxes, I was happy to see the neatness with which the ingredients were packed. I decided to do the Sumac Chicken in the morning and the Thai Green Curry in the evening, as shelf life for the box is advised to be twelve hours. Preparing the Sumac Chicken included cutting the chicken breast pieces into thin slices, applying the marinade supplied by them, and then cooking the chicken in olive oil sent in a bottle. For the salad, the veggies as well as feta cheese and olive were packed in small plastic packets. The dressing was supplied in a separate bottle. I had no problems preparing the dish as the instructions were crystal clear. 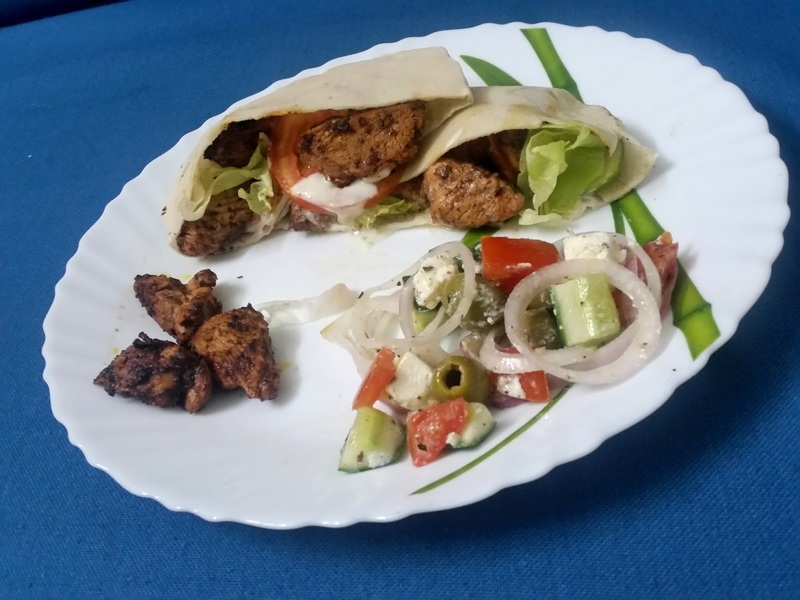 The pita pockets had to be reheated before assembling the final dish, and within 30 minutes the whole meal was ready with dollops of Tahini sauce and the meat and veggies inside the pita. The quantity supplied was good for two persons, but we had friends visiting, so we shared it among us. Everyone liked the dish, the only complaint was from me of the salt was a trifle more than my liking. 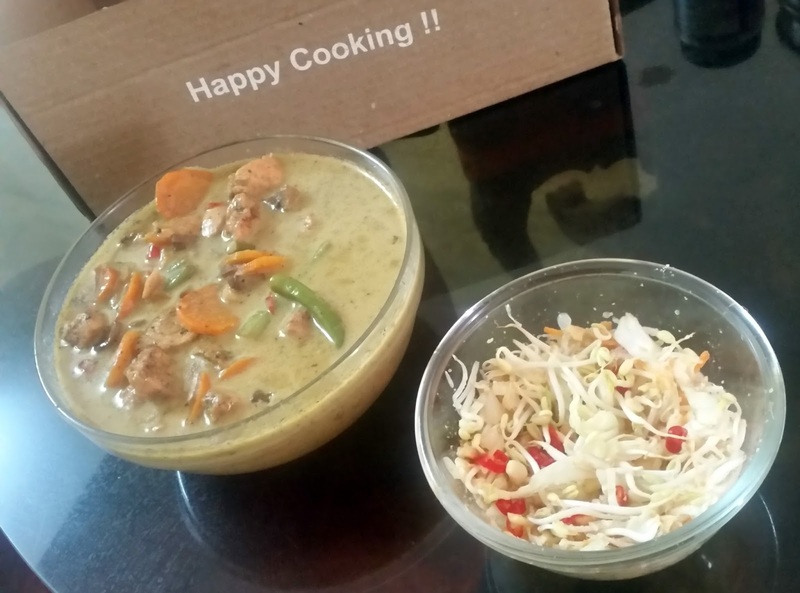 In the evening I tried out the Thai Green Curry. 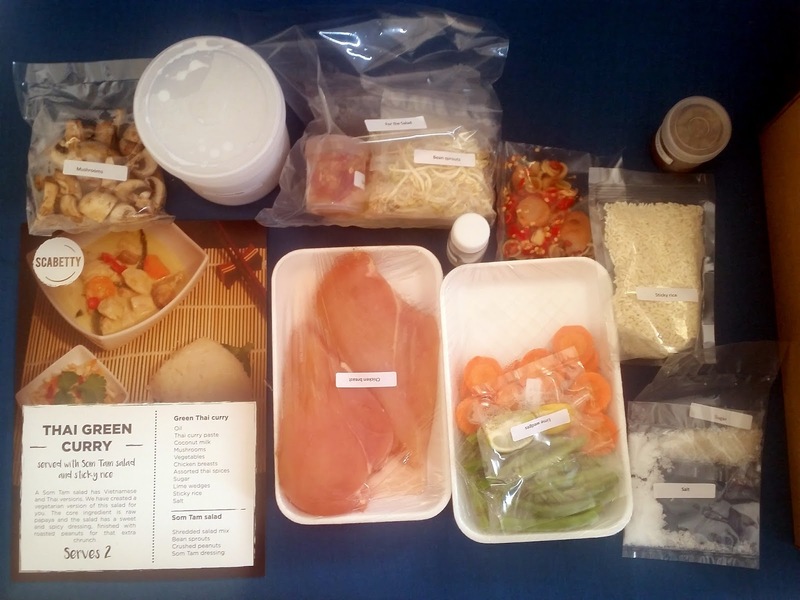 The method had three parts – cooking the chicken, and preparing the sticky rice and the salad. The steps given here nicely juggled between the three processes to ensure that the meal was ready in half an hour. Except in one place of confusion (on whether throw out the water after boiling the veggies or add the water while making the curry) I could do the cooking seamlessly. The Thai Chicken Curry worked out well with sticky rice, and the sweet and spicy Som Tam salad with crushed peanuts and the dressing. The main advantages of the product are that the process is simple, and you can have all the ingredients in the optimal quantities from a single source. Also as the dishes can be prepared in under thirty minutes, it is not much of a bother to prepare dinner after office. Scabetty understands the importance of the health aspect, and the recipes are designed by expert chefs keeping this in mind. The whole process is very convenient and the step by step instructions lucid. 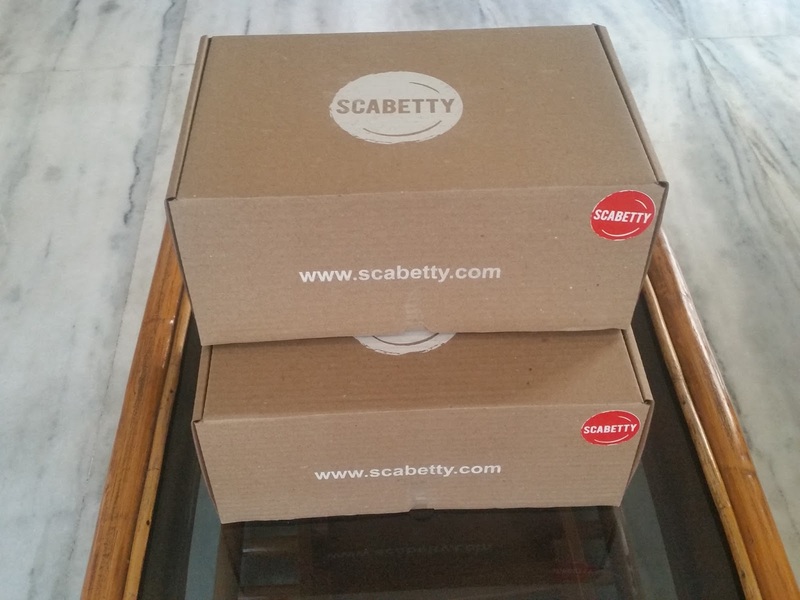 As opposed to some other suppliers, Scabetty boxes are full meals, so you need not separately prepare any sides or carbs for the main course. Scabetty has the list of dishes available on their website. When I had a look, it had about a dozen items including a dessert (Tiramisu). A friend mentioned that she tried out the tiramisu and it worked out pretty well. Things in the current menu which interested me are Chicken Chimichanga, Blackened Chicken, Laksa and Lasagne. Since the shelf life is twelve hours, you have to prepare and consume on the same day. However, their website has the provision of ordering five different items together, each to be delivered on five different days. The price is Rs. 450 for a vegetarian box & desserts and Rs. 550 for a non-vegetarian box. Each box has sufficient quantity for a complete meal for two people. They change their menu every month to avoid monotony in their customers.